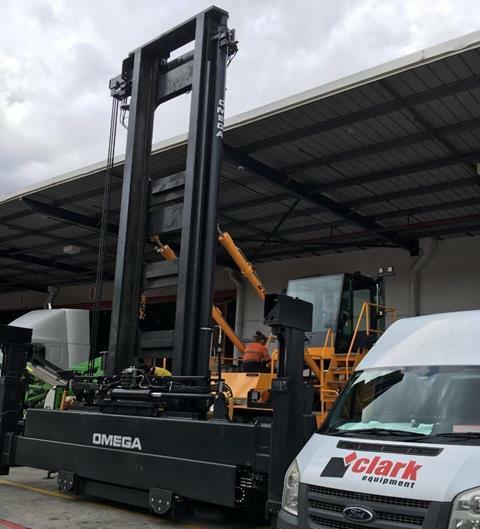 OMEGA Heavy Lift Trucks recently partnered with GRACE Worldwide (Australia) to engineer an innovative solution to meet their safety needs. A brand new 4ECH was delivered to GRACE, who had a need to stack containers 4 high but had an immovable awning. OMEGA set out to ensure a system was supplied to detect the awning to avoid risk of damage to the awning or truck and ensure employee safety. The OMEGUARDIAN photoelectric 3D sensor system was installed. This system measures volume, distance and level detection. 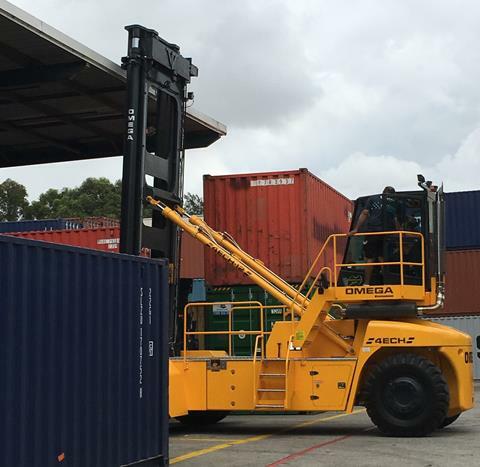 This powerful technology is used to recognise specific objects and programmed to not only detect the awning, but ignore normal container stacks. When the awning is detected, the truck will alert the driver with both an audible and visual alarm. The trucks speed is automatically reduced to 1km/h when the distance to the awning is less than 2 meters. Coupled with the integrated stability programming, inherently superior tip-up factors and cabs designed to exceed the standards for occupant protection – this is further evidence of OMEGA Heavy Lift Trucks commitment to innovation and safety! "GRACE Worldwide handles millions of personal belongings every day, so we ensure we employ drivers that are very experienced. The extra safeguards provided by the OMEGA System helps protect our staff, the equipment and our precious cargo. We are very proud to have partnered with OMEGA in this innovative solution." Designed with the operator in mind, the extensive new Omega touchscreen comes with complete connectivity at the swipe of a finger. Our team knows what it takes to design a heavy truck to handle the tough Australian landscape. Born out of the factory in Sydney NSW, we have constantly refined componentry and technology with the wealth of knowledge and experience our engineers have. Whether you require a truck to handle the intensity of round-the-clock applications within a port or all the way in the outback, we build our trucks ready for here. VISA Global Logistics newest distribution center recently opened for business at a state of the art facility in Erskine Park, Sydney. The demands on the facility are high, as VISA continues to grow, and the operation mandates the equipment provide high levels of reliability and performance.